NVIDIA Flow is GameWorks' latest offering for combustible fluid, fire and smoke simulation, following in the footsteps of NVIDIA Turbulence and FlameWorks. The Flow library provides DX11, DX12 and Vulkan implementations, and will run on any recent DX11 or DX12-capable GPU. 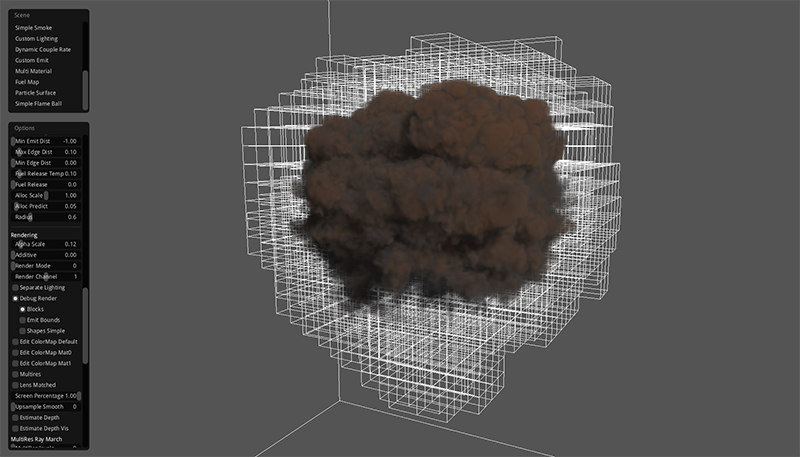 The fluid simulation in NVIDIA Flow is modeled on an adaptive sparse voxel grid for maximum flexibility with the least memory impact, and is optimized for use of Volume Tiled Resources when available. NVIDIA Flow-1.1 is available with Vulkan support and new features at GDC 2018. The NVIDIA Flow demo application offers several sample effects where you can explore Flow behavior and learn about parameters that control the simulation. The API includes critical functionality to simulate and render fire/smoke in a game engine. Additional APIs do support custom rendering, so that engines can build native support. Library on Github Note: you must join the Github GameWorks Access team by clicking the green button above before this link will work!